All well and good, total oppsite APU of the current Prog. Updated the title to include the strapline. Just picked this up, and have noticed the next floppy (in #400) is another Dredd one. Thought it was supposed to be Return To Armageddon? And, #400 is to be perfect bound. Whoop! Rest of the Meg looks splendid this month too. I thought it was supposed to be Mind Wars? Another great Redondo strip. That too! I have a bad leg and have had to walk to town and back, so apologies. Another great Meg with Strange Brigade and The Returners the highlights. That was also my understanding and I was looking forward to Mind Wars. I never read this strip so little bit disappointed with the floppy next month. Bah. I used to love the perfect-bound Meg, but now rather like the stapled version, because it seems better for comics. (Easier to open; less chance of damage in transit.) All the Marvel reprints have gone perfect bound, and I'm not keen. 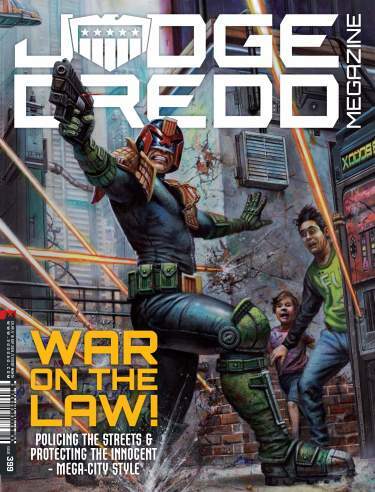 Makes sense for it to be a Dredd floppy in the 400th issue.....maximum Dredd I guess. Having recently sorted out all of my megs, does the Megazine win any awards for most convoluted issue numbering in a comic? I ended up having to use the dates on the front to work out what was happening at one point. Question for the guys that do not have a digital subscription: I noticed that the 3rd page of the Dredd story the scan quality is quite poor and very hazy is this the same for the printed version ? Ha, yes I had that issue when sorting out the prog. Volume 2 & 3 were a complete pain in the hoop when I inherited a collection. I've lived in a variety of places over the past few decades, and the megs have been split up into different boxes over that time. The last couple of months is the first time this century that I'll have the chance to get all the comics out at one time and try to put them back in order (never mind actually read the things) so I have all that to look forward to!